CRIME, GUNS, AND VIDEOTAPE: Do More Guns Increase Crime? Here’s your answer! St. Louis, MO—Last April the NRA held its Convention here. More than 60,000 attendees came to see both the political side and the large gun show. The NRA visits scattered locations throughout the nation every year. These conventions are never held in the gun-unfriendly states but in states where the attendees can carry loaded and concealed firearms. The various convention centers must suspend any gun carry prohibitions they may have any in order to win the NRA’s business. Never less that 60,000 NRA people, most all of them well armed stay for about five or six days in these cities. The crime rate never rises and there’s never been a known arrest of an attendee for violence. You also never hear about the NRA attendees being robbed, raped or murdered. The cowardly local criminals always lay low when the NRA is in town. Across this nation there have been tens of thousands of gun shows and again nobody settles their arguments with guns. 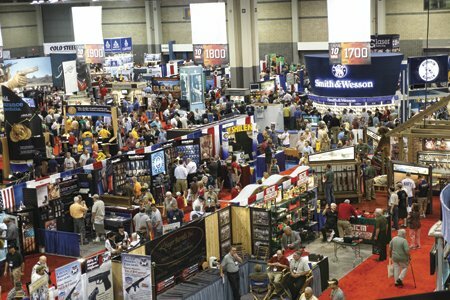 There is never misuse of the massive amount of firearms on display or carried by gun show attendees. We don’t have a gun problem except when the law-abiding are precluded from the keeping and bearing of firearms. We do have a serious crime problem that’s been fueled by a failed violent Drug War for over four decades. The real problem is the courts simply refuse to separate the convicted and dangerous offenders from society. By the way the next NRA Convention will be in the Spring of 20123 in Houston, TX.